A simple answer to a straightforward question turned out to be not quite the thing for former Eskom Chief Executive Brian Molefe. Maintaining he took early retirement, and did not resign as the courts would hear next week, he told the public enterprises State Capture inquiry: “The battle I chose was load shedding”. And while Molefe publicly announced his stepping down in the interest of good governance after the public protector’s 2016 State of Capture report, on Tuesday night that document was described as “notes” and “observation” – and, without findings “just fresh air”. By MARIANNE MERTEN. It’s a telling analogy from former Eskom CEO Brian Molefe to MPs, early into his almost six-hour session. It says that until the formal piece of paper is in the correct folder, anything can be said. The statement came days after the public protector’s State of Capture report linked him to members of the Gupta family through telephone communications at a time when one of that family-linked business, Tegeta, was purchasing Optimum coal mine. Public Enterprises Minister Lynne Brown accepted Molefe’s decision – she publicly said she thought it was a resignation – and Eskom moved to announce Molefe’s acting successor. Molefe maintained throughout he took early retirement, that there had been an error in the processing and that’s that – pending the court hearing next week. He came to Parliament as a pensioner earlier this year, although he admitted in his three or so months at the national legislature he never completed a declaration of interests, which would have had to include the Eskom pension. The resignation/early retirement controversy that burst into the open earlier this year embarrassed Brown, who publicly said she thought Molefe had resigned, and then stood by her man’s return to Eskom, saying in a media briefing on 12 May it would be “a significantly better value proposition” to the fiscus to take Molefe back at the helm of Eskom. Public outrage led to the formation and intervention of an inter-ministerial committee which effectively ordered the power utility board to rescind the decision to pension off Molefe at a cost of R30.1-million to the Eskom pension fund. Public Enterprise Minister Lynne Brown has submitted in court documents saying she thought Molefe’s departure had been a resignation. 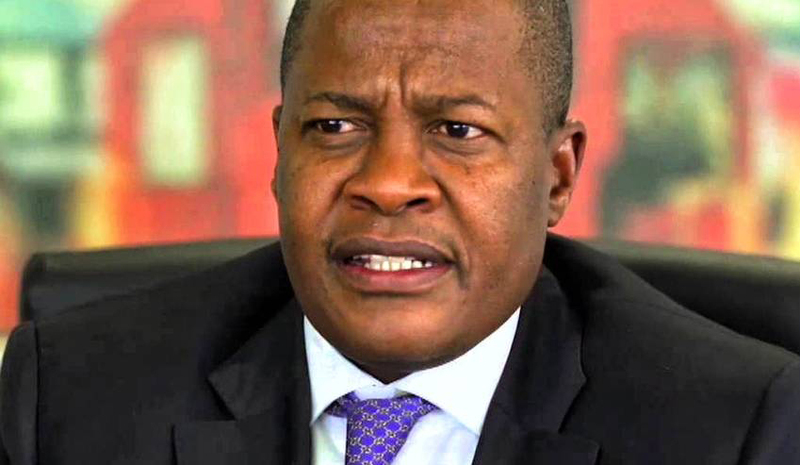 On Tuesday night Molefe’s response was that the minister has given several versions to court, although Molefe acknowledged he had gone to Brown’s Cape Town home as a courtesy to inform her of his decision. “Minister Brown says her recollection is that I resigned. I dispute that,” he told MPs. On other Eskom controversies Molefe also stayed on message. And the former power utility boss said: “I have no direct knowledge” of payments to the Gupta-linked Trillian Capital Partners, in its off-the-books dealings with McKinsey. He did acknowledge making some enquiries and being told work had been done. “I do not have first hand knowledge”, was the response to the various contracts acting CE Matshela Koko signed off on, including one with a company run by his daughter who lives in the same house as him. Clearly more comfortable traversing management speak, the history of the coal price haggling involving Hendrina power station, and praising the “young engineers” who made it possible to plan maintenance while keeping the lights on, Molefe at times was combative, interrupted MPs questions, decided to split verbal hairs and deliver the odd non-sequiturs. Like when EFF MP Thembinkosi Rawula asked about the level of the Gupta influence in Eskom: “If you were expecting me to switch off the electricity to their house because they are allegedly corrupt…” replied Molefe. But in response to Gordhan’s questions Molefe acknowledged contact with the Guptas as raised in the public protector State of Capture report released in late 2016. “Ja, at one stage or another there was contact of one form or another,” Molefe said. Previously Molefe highlighted how then public protector Thuli Madonsela had been unfair by making “notes” and “observations” with regards to his phone calls in the vicinity of Saxonwold, where the Guptas live, without giving him an opportunity to give his side of the story or without providing cell phone numbers and other such details. What exactly did Molefe mean by thinking about his future career options in that public statement as surely a pensioner would be more interested in playing golf, asked the DA MP. “Yes, I will decide, but I applied for early retirement,” said Molefe. “You are clutching at straws here,” said Mazzone. “The feeling is mutual,” Molefe shot back. In Molefe’s account to MPs, he’s done nothing wrong. But on several occasions he did acknowledge “my primary concern was to deal with load shedding”. It was his decision to focus on something to make an impact – and load shedding cost the South African economy over R400-million a day. And so, for example, he “did not look at” the Denton report, including its findings on corruption in Eskom. He trusted the Chief Financial Office Anoj Singh, now suspended, and head of generations, Matshela Koko, who became interim chief executive and was later suspended. But that’s exactly it – there is always someone else, or a paper trail, to finger for the troubles with governance at Eskom, where executives were authorised to sign off on deals valued up to R750-million and also at board level. Molefe repeatedly told MPs that Singh would be able to provide the answers they were looking for. Earlier on Tuesday Eskom board member Venete Klein, in charge of the people and governance sub-committee, repeatedly told MPs all that was ever officially approved on 9 February 2016 was to provide Molefe with an additional five year’s pension benefits when he retired. That has been done with previous CEOs, she said, and that had been the resolution. Yet her comments to MPs come against the background of her written statement submitted to the inquiry which clearly indicates awareness of a letter from 25 November 2015 by then board chairperson Ben Ngubane that outlined that when Molefe left age 50 after less than two years at Eskom, he would qualify for pension benefits as if he worked there until age 63. Those arrangements correspond to what the Eskom pension fund presented to the inquiry last month.